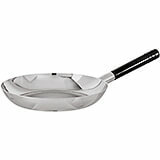 Frying pans are shallow wide pans with a single long handle and sloping sides that allow the cook to flip and toss items without using a spatula. Use for sweating, searing, browning, stir-frying and frying. This stainless steel cookware cannot be used in induction stove tops. 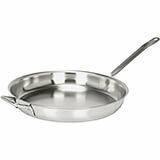 13.625" X 10.625" X 2.5"
Stainless Steel, 18/10 Steel Catering Frypan, 4.54 Qt.